STAND ONLY! THIS IS NOT A KIT. 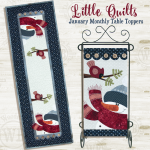 This is the stand on which our "Little Quilts Monthly Table Topper" small hangings fit perfectly.